California Charter Schools Association, which supports the charter school movement statewide, selected Bullis Charter School as one of approximately 50 charter schools across the state to participate in the My School! program. Selected schools agree to incorporate the program into curriculum projects and community activities, and create dialogue among educators and parents about what their school means to them. Bullis Charter School announced its support for the My School! public awareness campaign Nov. 13. “Bullis Charter School has become well ­known for its outstanding academic and extracurricular programs. The My School! campaign is an opportunity for the students to have fun while highlighting these areas of education,” said Darin Conway, parent of two Bullis Charter School students. Bullis Charter School is the highest­ scoring California charter school and ranks among the top 1 percent of all schools in the state. 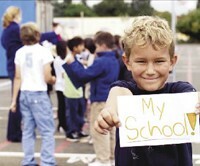 The California Charter Schools Association kicked off the campaign with the introduction of an interactive Web site, www.myschool.org. The site supports the charter school movement and provides an online resource for parents across the state searching for a public charter school in their community.